This is the master suite of Bernard Gray Hall Bed and Breakfast. It was part of the addition to the existing home in c.1907. by Doctor Rigg who renovated the house at that time to include his office and the master suite. The Shaw suite has a King bed, sitting room and private ensuite bathroom. The sitting room has a bed-sofa and TV. The Magnolia room was named as such because of the large magnolia tree it faces in the back of the house. In late May and June is the best time to enjoy the full bloom of this huge magnolia tree. The Magnolia room has the charm of antiques, king bed, and a newly renovated private ensuite bathroom with tub/shower combination. A very comfortable room. 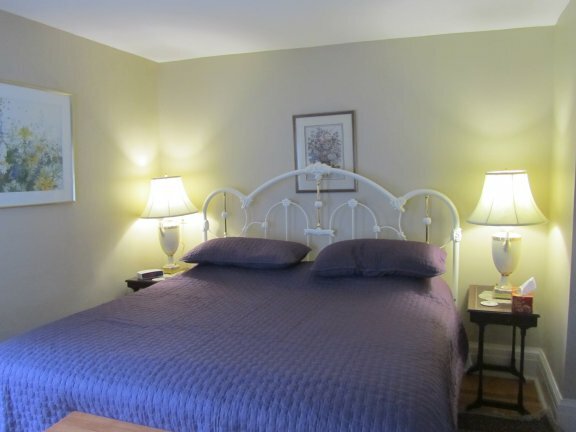 Named after a distant relation to Laura Secord stayed in this room, the Secord suite is a large bright suite contains a king bed or 2 twin beds and sitting area with a sofa and table. Flat screen TV. The Secord suite was originally 2 bedrooms. It was renovated into one large suite with private bathroom for the added comfort of our guests. The Secord suite as well as the Shaw suite are comfortable accommodations for multiple nights stays. Full varied hot breakfast each morning including choices of cheese omelettes, French toast, pancakes, fruit plates, or the traditional breakfast of bacon/ham and eggs (eggs any style) also baked goods, cereal, coffee, tea, and fruit served with each breakfast. Special diets will be accommodated.